Accent Border - This is an optional 1" border that is exclusive to T-Shirt Quilts of Texas. It gives that extra 'POP' of color to the quilt. All-Over Quilting - Sometimes called edge-to-edge quilting, all-over patterns can be completed on a longarm machine. the pattern is repeated from the left edge to the right edge creating an overall pleasing desing. Backing - The backing material is the fabric that you see on the back of a quilt. There are many quality levels available for quilters to choose from. Make sure you get a high quality 100% cotton fabric or flannel and not a cheap fleece or 'sheet'. Poly/Cotton blend Flannel - Try to avoid. Usually a very loosely woven fabric. Will shrink a bunch when laundered. Binding - The piece of material that finishes the raw edges of the quilt. There are several methods of finishing the raw edges of a quilt. It is usually the same fabric as the Border or the Backing. Blanket - What non-professionals call their product. Usually, just consists of the t-shirts and a backing of some sort. Be sure to ask what the 'backing' fabric that is being used. Article about difference between a quilt and a blanket delves deeper in the topic..
Block - ONE square in the quilt. Can be made up of one shirt or a combination of several tees. 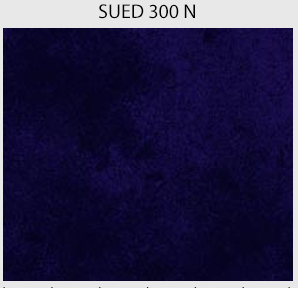 (see combines or additional seams).This could be one side of a t-shirt, the front and back combined to one square, or two (or more) shirts combined to make one square. Block Repair - If a shirt is pre-cut, we must repair the block to fit our block system. This may mean cutting the piece down or sewing it to a bigger piece of material. Border - Borders are strips of fabric that go around the outside of the quilt. This gives the quilt a 'finished' look. Chaos Style T-Shirt Quilt - Quilt top is made up of random sized squares and usually looks like a chaotic mess. ( Also referred to as Random, mosaic or puzzle quilt) Only trust the professionals to do this. Clothing Quilt - Quilts made from clothing other than t-shirts. These are usually Memory Quilts, and made from clothing from those that have passed on. Collars - Like a neckline, this is the part of the garment that encircles the neck; normally there is extra material to be raised or folded over (like a business shirt, for example). Cornerstones - The square of fabric that is at the intersection of the sashing fabrics. These add pops of color and usually are the same fabric as the outer border or the accent border. Crazy Quilt Style - Random strips and pieces of fabric. Very time consuming, but great with when using lots of different clothing fabrics and colors. Domestic Sewing Machine (DSM)- Home sewing machine. Usually used for home sewing and clothing. This is the sewing machine that you or your mom have at home for general sewing. Edge To Edge Quilting - Quilting pattern that is repeated from one side of the quilt to the other side. See Pantograph quilting. Expedite/Rush - When you need the quilt sooner than the standard 4-week turnaround time. Mostly occurs around graduation and the Christmas holidays. Fabric Types - Cotton, polyester, silk. With Quilt Shop Quality fabrics, we are working with 100% cotton fabrics. Fillers - Creating new blocks because you are short a block or two with piecing a block or with embroidery. Flannel Back - Optional fabric upgrade to add extra warmth to your quilt. Graduation Quilt - The quilt that HAS to be done before the graduation party! Be sure to let us know when the party date is. It is not always the same as graduation date. Interfacing - We use 100% woven cotton. Very soft drape. It is just as soft as your t-shirt. Watch out for the 'stiff stuff' such as Pellon or other man-made materials. Jersey Material - T-shirts are actually considered a jersey material. 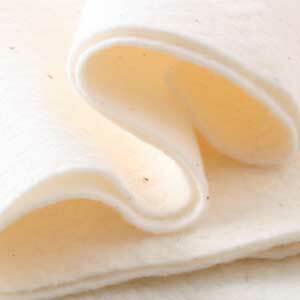 It is a 'knit' fabric from either 100% cotton or cotton/polyester blends. Layout - The order that you would like the quilt laid out. We generally term the layout left to right, row by row. Long-arm Quilting Machine - The HEAD of the sewing machine moves rather than the fabric moving under a sewing machine needle. Long-arm Quilting, Computerized - A computer drives the longarm sewing machine making for prettier and more efficient designs. Long-arm Quilting Non-Computerized - Quilting done from the 'back' of the machine. Can also be 'free-hand' which usually means scribbles or creative stitching based on what is in the quilt block. Most quilt-makers are NOT skilled in this. Meander - This is a generic term for an all-over quilting design. 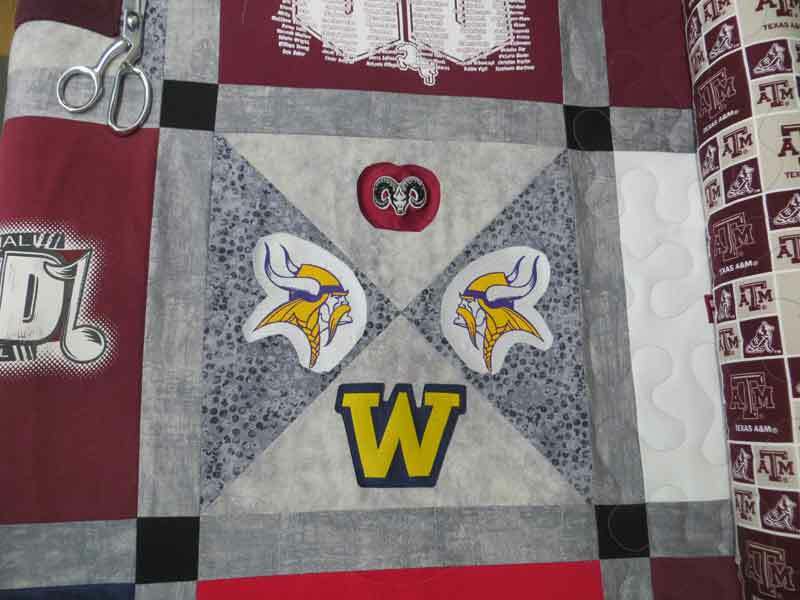 Memory Quilts - A quilt that is made from a passed loved one's T-shirts or clothing. A memorial quilt is a great way to preserve their memory. Necklines - The necks of the tee shirts are included (or not). Usually included as an aid to center the image on the tshirt in the square. Overall Quilting - Overall quilting is characterized by a single pattern repeated throughout the entire quilt. Pantograph Quilting - In longarm quilting terms, a pattern is quilted from the left side of the quilt across the width of the quilt to the right side of the quilt. The quilt is 'rolled' and the pattern is repeated. Project Box - This is the plastic tub where your tshirts, paperwork and the rest of your quilt is contained while we work on it. This keeps it from being confused with other customers tshirts. Quilt - THREE LAYERs - A quilt consists of a Top, Batting, and Backing. If there are not 3 layers then it is a blanket or maybe a duvet. Quilt Top - The very top layer of a quilt. With t-shirt quilts, this is the layer that contains YOUR t-shirts, sashings and borders. QuiltWash Soap - A special soap that is used to keep the colors in your quilts from fading. The best way to take care of your quilt for years and years to come. Random Style T-Shirt Quilt - Random sized blocks. Most of these quilts end up as a garbled mess. Sashing - Fabric dividing the rows and columns of a traditional block style quilt. This is the fabric that goes around the t-shirts. Sew Downs - 3 dimensional items. Openings - of any kind. Such as buttons, flaps, 3-dimensional items, lace or other things that might get in the way when quilting. Stippling - See meander. Kind of a random puzzle piece shape that is done as an overall quilting pattern. Stitch In The Ditch - Stitching along the seam lines. Usually done by non-professional quilters on their domestic sewing machines. T-Shirt Pillow - Pillows made from t-shirts, dress shirts, multiple shirts or other pillows made from clothing. Tech Fabric - Bicycle fabric. These are neat fabrics made to wick away sweat and moisture. These fabrics are great in tee shirt quilts. Theme Quilt - When a quilt consists of shirts with one theme. Harley-Davidson, Star Wars, Theatre, Fraternity, Sorority, Vacation, Collegiate, pets, or whatever YOUR favorite collections consist of. Thread - How can you quilt a quilt without thread? We use the highest quality quilting thread to piece and quilt your quilt. Tone On Tone - Fabrics that contain several shades of the same color. This adds 'texture' and is not boring like solid color fabrics. Also helps hide lint and pet hair on a quilt that is expected to last a lifetime. Traditional Style T-Shirt Quilt - Traditional t-shirt quilts are based on traditional quilt styles. Not the crazy mish-mash of random t-shirt quilts. Two-Sided Quilt -This usually means that there are tshirts on the top-side AND the back-side of the quilt. All quilts have two sides (top and bottom). 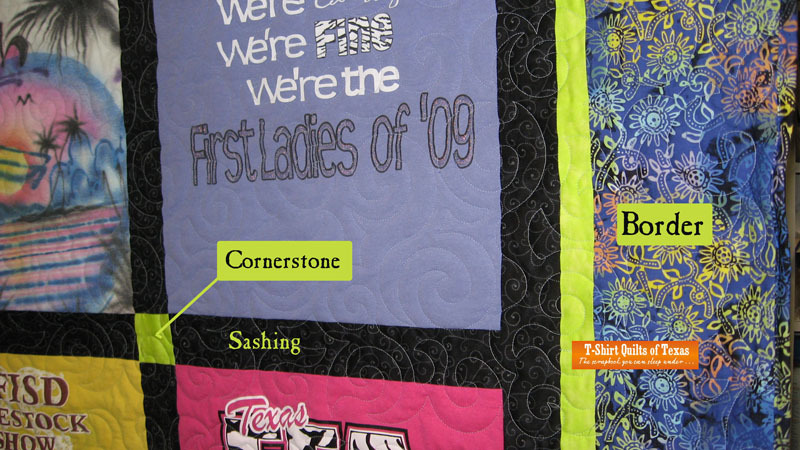 T-Shirt Quilts of Texas is one of the premiere tshirt quilt makers in the country. 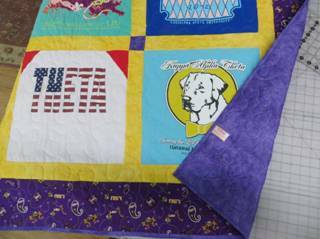 With over 30 years of quilting and over 13 years making tee shirt and memory quilts.